SAR has more floatation material than a conventional 50N buoyancy aid, giving enhanced in-water freeboard. SAR is equipped with an integrated safety harness which has stainless steel attachment D-rings on the front and back, double crutch strap, two large fleece-lined pockets, one with a velcro closure and the other a zip. There are also two smaller divided pockets fitted on the chest area, one pocket has a whistle and the other pocket can be used, for example to attach a knife. 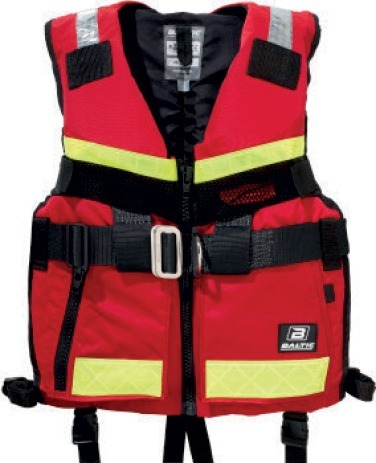 SAR is a one-size buoyancy aid, adjusted by using the waistband and side adjusters for a snug fit. Fitted with retro-reflectors to provide high visibility and attachment points on the chest for emergency and VHF / radio.